3. Set slow cooker on low and cook for at least 7 hours. 4. After the stroganoff has cooked for 7 hours, stir in the sour cream and the cornstarch mixed with the splash of water. The mixture will need to thicken up a bit. 5. Leave lid off and place on high for 15 minutes. 7. Replace lid, turn down to low and let simmer for an additional 5 minutes. Serve over prepared egg noodles or mashed potatoes. *When I’m cooking in a slow cooker, I always go easy on the salt at first because it’s hard to judge the salt level when it’s uncooked and cold. It’s much easier to add more later on. Thoughts: We ate this over egg noodles. I actually really, really loved this. The meat became very tender and some pieces just fell apart in your mouth. The onions just melted away into the sauce and the dill and chives brought everything together. BD has eaten 4 bowls of this in two days. I can always tell when he really loves something of mine because he won’t.stop.eating.it. This is a perfect meal for a cold and dreary day like it is in Tampa today. Curl up with a bowl of this and then take a nice nap afterwards. 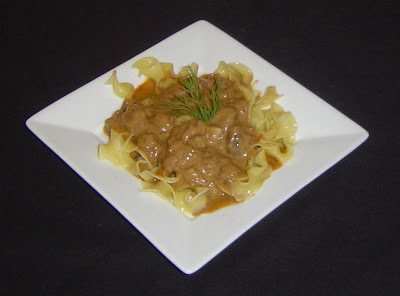 Oooh I may have to steal this recipe, my husband loves Beef Stroganoff. Help!! I'm making this today, and I need to know at what point the mushrooms go in! Jane - they go in with the beef before you start to cook. Thanks for the catch - I'll update the recipe!